A newly constructed complex located between Cable Beach and West Ridge. An area of New Providence conveniently located one block of West Bay Street, and 15 minutes from the Airport and Cable Beach hotels and casinos. You can also catch the #10 bus to and from downtown Nassau, or they can connect you to other buses to anywhere you would like to go. The interior is completely brand new with granite counter tops in the kitchen and bathrooms, beautiful porcelain tiled floors, solid pine doors, tray ceilings with recess lighting in living room area and the kitchen is furnished with new stainless steel appliances. At the end of the living room is a balcony to sit outside and catch the Bahamian breeze. We just got a back up generator just in case electricity goes off! This is a newly constructed building between Cable Beach and WestRidge, an area of New Providence, conveniently located one block off West Bay Street, and fifteen minutes away from the airport, and all the Cable Beach hotels, restaurants and casino. 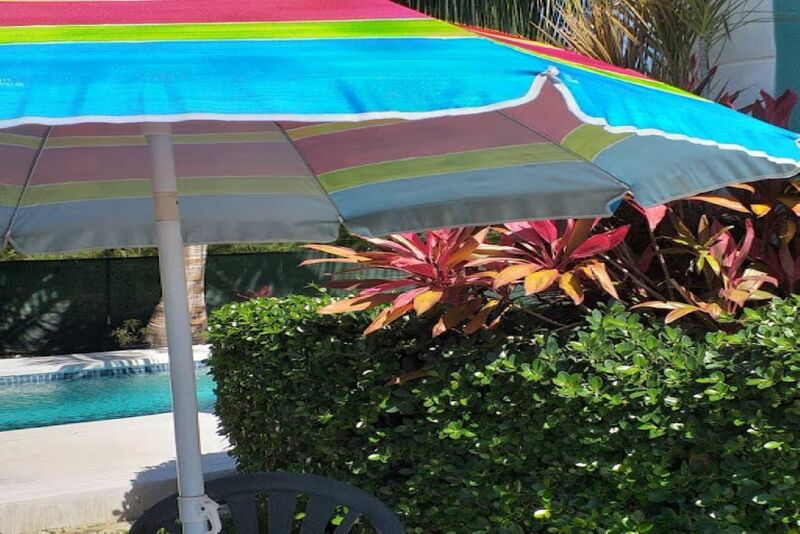 The house is located about five minutes from three of our local beaches and park. You can also catch the #10 bus to and from downtown Nassau, or anywhere you would like to go. At Christmas time we have the local junkanoo festival, and through the summer months, June through August we have the goombay festival which is held at Arawak Cay. There is also various arts, crafts and local straw works at the Straw Market located downtown. Neighborhood:: Cedar Pine Villas is located in a quiet neighborhood with friendly families. The area is safe and lighted at night. We are also located at the dead end of the corner, free from all disturbances. Leisure & Dining:: Cedar pine Villas is located near approximately six Bahamian restaurants. At these eateries you can experience the best Bahamian cuisine at very affordable prices. Below is a list of a variety of Bahamian restaurants located nearby: West of Cedar Pine Villas is Nettie's Place, Poop Deck, Nesbitts, Traveller's Rest & Compass Point. East of Cedar Pine is Olive's Meze Grill, The Pot, Milano Bistro, Fish fry at Arawak Cay, and much, much more. I was born in San Salvador, another Island of the Commonwealth of The Bahamas! I completed my senior education in Nassau, Bahamas. I also lived in Freeport, Grand Bahama. I currently live in Nassau. We built the house in 2008! This is our retirement home. This is one of the upscale areas in Cable Beach. We are near to the banks, restaurant, food markets, hotels, and beaches! Quiet, and away from congestion! We are gated, and have our own private generator, just in case the electricity goes off! We normally try to meet our guests at the airport! If we can't transport them to the house, then we use a taxi company to transport them which gives a discount. This property is located near the Airport, banks, restaurant, Supermarkets, post office, the casino, Sandals, Breezes, & Bahamar which has bird watching and water parks coming soon. Also a mini straw Market. You don't have to go far for anything! toilet, combination tub/shower, Beautifully furnished with all necessities. Has the house of Assembly, the Senate & Supreme Court buildings, banks & shopping for perfume & jewelry. Sandals Resort has a nice beach open to the public. Poop deck, nice beach view from inside the restaurant. Traveller's Rest, great beach front. Compass Point, great water view from outside restaurant, there's also a dock to perform a wedding ceremony. bath, hand, wash cloths & beach towels provided. Stainless steel - medium size 18 cu. ft.
books about The Bahamas & other magazines. 2 Bedrooms, Sleeps 6: Master Bedroom - 1 Queen, Guest Bedroom - 1 Queen. Beautifully furnished with flat screen TVs. 2 Bathrooms: Bathroom 1 - Toilet, Combination Tub/Shower, Bathroom 2 - Toilet, Combination Tub/Shower. Beautifully decorated. We have two patio tables with chairs and extra beach chairs. we also have a table for 2 by the pool, floats & a beach ball. We have a table on the patio for 2 as well! Great place and owners. I don't believe there's a better place in Nassau. I'm happy you enjoyed your stay and the house! We always strive to please our guests to make their visit as great as possible! Have a safe and good 2019! The owner was awesome. She offered to pick us up. The place was clean. We would definitely come back. Villa had everything we needed for our 3 night stay. Elrena meet us at the airport which was super convenient. Showed us where the stores are, the best local beach which was walking distance. Would suggest a visit to Marco’s pizza which is across the street from grocery store. Steps away from BTC phone store where you can get a SIM card. Also, take the Nassau funky Jeep tour, it’s well worth the $ especially if you do the pm tour. If we were to return to Nassau, we’d stay here again. Really good to know that you enjoyed your short stay at Cedar Pine Villas! It was a pleasure to have you, and we look forward to having you again! The property was extremely clean, the hosts are very nice and helpful. I felt safe the entire time. My family had a wonderful time staying at Cedar Pine Villas in Nassau, Bahamas. The villa was spacious and very comfortable. Very clean and well-equipped kitchen. Convenient to have laundry on site. Bathrooms were well appointed. The owners were so friendly and welcoming. Quiet neighborhood with private pool. Would highly recommend these accommodations to anyone looking for a home away from home. ! It was great to house our guest! Always want them to have a good time! I'm glad they enjoyed their stay at Cedar Pine Villas! You are a welcome at any time!!! The rental was very homey and comfortable. The owner was exceptionally responsive to our needs. She provided us with invaluable information about activities and locations of interest in Nassau and the Bahamas. Everything was as advertised and there were no issues of any kind. A great rental!! I would like to thank my guest for a wonderful review! As always, I try my best to make their stay enjoyable!! I'm happy they enjoyed their stay as well as all the activities! We await your next visit!!! of Yorkshire Street West, between 2 Super markets. Sandals hotel, the post office, a pub, 2 beaches etc are near the house as well.